The temperature is dropping and we're expecting snow again. It's been one of those days when you know you should be doing something but just can't seem to get up and do it. Making bread is basically a lazy process and perfect for lazy days. You make the bread and then let it rise while you take a nap. And if you time it right when you wake up the bread is ready for baking...perfect. I had a complicated dinner planned for today but opted for hamburgers on a Sourdough Potato Bun. The Sourdough Potato Buns were most excellent! In fact so good that Mr. Tastebuds ate 3 with just butter! Cook the potato until soft either by boiling, baking in the oven or microwave. Let the potatoes cool a bit and then mash. Combine the mashed potato, butter, yeast, salt, pepper, milk, sourdough starter and basil in a large bowl. I riced my potatoes and they were still a little lumpy. So instead of just mixing with a spatula I used the immersible hand blender until well blended. Gradually add 3 c. of flour. I like my bread doughs rather wet but if you don't just add about another 1/2 flour until it's the consistency you like. Knead for about 5 minutes. Put 1-2 TBL EVOO in a large bowl and place the dough in the bowl. Then turn the dough over so all sides of the dough are covered with EVOO. Cover the bowl with a towel or put the bowl in a large plastic bag. Let rise for about 1-1 1/2 hours or until doubled in size. With well floured hands remove the dough from the bowl and begin tearing off pieces of dough and forming them for Hamburger Buns. I pinched off pieces a little smaller then a tennis ball. You will have to flour your hands often. Placed the buns on a parchment lined baking sheet. Brush each bun with EVOO and sprinkle with either sesame or poppy seeds. For the final rise place the baking sheet in a large plastic bag making sure to support the plastic with small juice glasses or 1/2 pint jars. Set it aside to rise for about an hour. Preheat the oven to 375 degrees. I spritzed the rolls with a gentle spray of water before putting them in the oven. Bake for about 15 minutes and then rotate the pan. Bake for about another 10 minutes. The buns are done with the bottoms are slightly browned and crispy. What wonderful buns, I can understand Mr. Tastebuds ate three just like that!!! Thanks so much for entering them to this month BBD#17! So just a two questions here: what's EVOO, (maybe a stupid question, but I never heard of that here) is it something american? And question 2... is that your stove? is it??? if you say yes, I'll turn green of envy on the spot. if you say no I'll turn green of greed... I want one!!! Marvelous. And yes that my Wolf range and I LOVE IT! It's the best stove and makes my cooking SoooooooOOOOoooo much easier! Thanks... olive oil, I'd never have though about that!! OK I'm offially GREEN now! 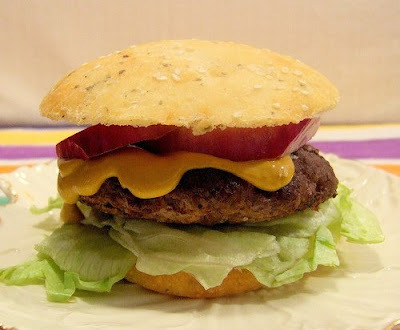 Mmm, my boyfriend love potato bread, and he always insists on buying potato buns when we make any type of burger. I can't wait to make this potato bread for him--especially when you tell me that it's a lazy recipe (sounds perfect for me)! Your bread looks delicious; I'm pretty sure I could plop down with Mr. Tastebuds and eat some potato bread and butter--who needs the burger with bread this good? These buns look wonderful. Its really amazing how you come up with your own recipes. I wish I had that talent! They look very good, Michelle! 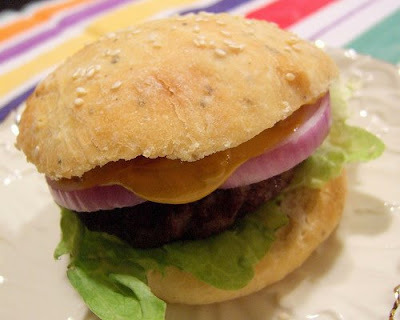 Your rolls look great, especially when there is a juicy hamburger in the middle. Nice job. sounds wonderful. Is the starter the potato mixture? Or are you maintaining a seperate starter? Thanks! I keep a sourdough starter going all the time. It's pretty easy to do once I got the hang of it. I don't know what I'd do without my sd starter now. I use mine all the time. For this recipe I used my sd starter and yeast. I wanted the dough to rise quickly so the sd starter was really just for taste not to make the bread rise. I have a sourdough starter. It's really nice, made from organic grapes and really a naturally made starter. It's beautiful. It's from Nancy Silverton's La Brea Bakery. I'm not sure I could use it here, but maybe I will give it a whirl and see what happens. This looks so wonderful. Beautiful job on the making and the photographing! I have got to get this cookbook...I see it everywhere and I see the results: all of the GOOD! Great job. oh my gosh! I want a hamburger!!! These look great! That your range, I am soooo jealous!